Let's face it: the quantified-self movement is all about strapping gadgets to your body and letting them tell you things that you already know. Aside from marathon-running gym worshippers, we're all keenly aware that we could be taking better care of ourselves. Of course, those fancy devices do offer a means to record your data in a way that makes it easy to track your progress, hopefully motivating you to concentrate on getting your activity graph to go up while your weight goes down. We're two or three generations into the market now, and the crude pedometers of yore have been replaced with units packed with altimeters and accelerometers that promise to faithfully track everything from how many stairs you've climbed to how well you slept last night. Withings is a French company that's synonymous with the whole fitness tracker movement; it's perhaps best known for its heart rate monitors and smart scales that push your weight, BMI, body fat percentage, heart rate and even local CO2 levels to the cloud. But until now, it's had a glaring omission in its lineup: an activity tracker that informs you of your progress apart from your early morning weigh-ins. Worse still, both Wahoo Fitness and Fitbit have encroached on Withings' home turf with their own weighing scales; more than ever, Withings needs an activity tracker to keep people locked into its ecosystem. That's where the Pulse comes in. 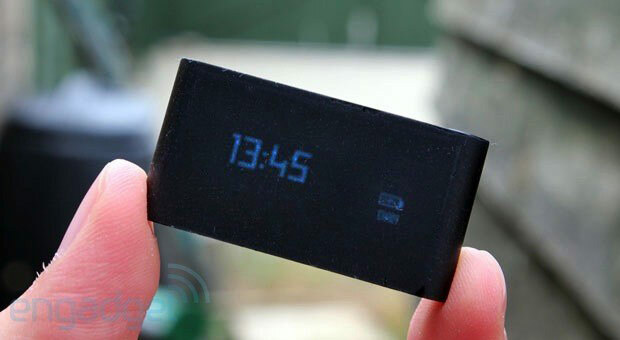 Like the Fitbit One, this rubber brick packs a pedometer, altimeter and sleep tracker, but unlike its rivals, it includes an optical heart rate sensor as well. With both the Pulse and the Fitbit priced at $100, is this extra feature enough to establish the French business as the world heavyweight? I spent a month with this device strapped to my waistband, so follow me as I take you through what it's like to have this as a constant companion. How would you rate the Pulse? While the company gets understandably defensive when people compare its new beauty to the Fitbit One, everything about the Pulse feels familiar. We're not suggesting it's a copy; just that it's clear the two were designed to occupy the same space in our lives. Similar to the Fitbit One, there's no built-in clip that allows you to attach the 1.69 x 0.87 x 0.31-inch unit to your belt. Instead, you force the eraser-sized device into a sturdy, rubber belt clip that's tough enough to withstand a full day of walking around, while a matching neoprene wristband allows you to take it with you to bed. Hold this in your hand and you'll initially feel nervous that you're about to break it. Indeed, at eight grams (0.2 ounce), it weighs less than a pack of gum, but it's sturdily built and doesn't buckle under pressure (believe us; we tried). Going around the device, you'll note a Withings logo up top as well as a lone physical button. On the bottom edge, you'll find the micro-USB port. Meanwhile, the rounded edges are bare, while there's an OLED touchscreen up front and the optical heart rate monitor on the rear. When we opened the box, we were relieved to find the company has wisely abandoned the original piano-black gloss that coated the sample we examined at CES back in January. Instead, Withings opted for a rubberized finish that hides any oily deposit from your hands and keeps your prized fitness gadget looking pristine. 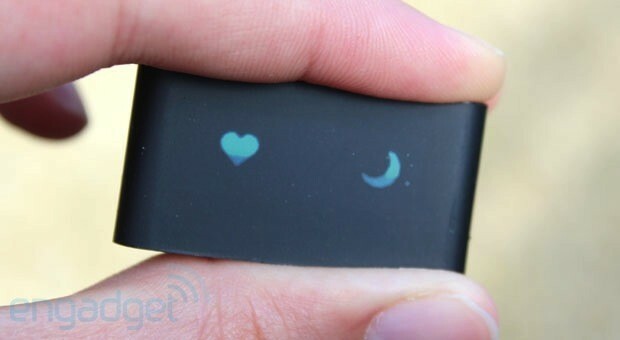 Unfortunately, since you'll be removing this device from its clip at least twice a day -- even more if you use the heart rate monitor -- then you'll notice the coating beginning to wear away at the edges, revealing the shiny black plastic that lurks underneath. The same thing happens on the belt clip; after a month of daily use, the rubber has already begun to falter. The company promises the device can last two weeks on a charge, and so far I've only needed to top it up twice in nearly five weeks of testing. Once you've exhausted the battery, recharging it takes around 40 minutes. The one issue I encountered was that it's otherwise impossible to deactivate the unit, which caused me a small problem when taking the device on a long-haul flight to the US. In the end, and after some fiddling, I let the screen power down and hoped that the Pulse's lack of an off switch wouldn't lead my flight to a premature end. When it comes to basic navigation, you'll use the physical key to cycle through the various options and then swipe at the touchscreen to get more information about whatever data the unit's collected. One press shows your steps taken; two, the altitude you've climbed; three, distance traveled; four, the calories burned that day. Five presses gives you a choice between sleep tracking and monitoring your heart rate, while six shows the current time and user account. When you choose either sleep tracking or heart rate monitoring, you'll need to tap a "Crescent Moon" or a "Heart" icon on the touchscreen. Then you either go to sleep (voilà! ), or push your finger gently onto the optical sensor. You'll know it worked when you see the green LEDs light up. Using the touchscreen, you can swipe left to right through those first four options up to 10 times, letting you see your progress for each of the last 10 days -- while a right-to-left swipe on the pedometer will let you see how long the Pulse believes you've been jogging that day. We found swiping around the device to be a smooth and responsive experience, although with 10 days' worth of data, you will find yourself doing a lot of thumb-work. But what of the heart rate sensor itself, you ask? Well, we found that the results were pretty good, except after we'd just finished some high-impact exercise. Then, the device would offer wildly divergent results one after the other. Of course, the optical reader is less accurate than other, medically approved methods and it's really intended for your resting heart rate. Use it in the correct way, then, and it's sufficiently accurate for you to use as a guide. Naturally, using the Pulse is as simple as ensuring that you've clipped it to your belt and that it hasn't run out of battery. This unobtrusiveness, however, makes it very easy to forget that you've got it on, and there were a few times when I'd go for a long walk, only to remember afterward that I'd left the Pulse attached to another pair of jeans. At least that's the excuse I'm sticking with, guv'nor. Withings' ecosystem relies rather heavily upon the cloud, and you have a choice of a website or mobile apps for accessing that information. While the web-based edition remains in beta (it's a long-overdue update on the old Withings website), the Health Mate app is now a mature, useful companion to both the Pulse and any of the company's other products, like the WS-50 Smart Body Analyzer. The service also lets you hook in data from other devices and apps like BodyMedia, MyFitnessPal and RunKeeper, but alas, even if you still own one of Zeo's mobile sleep-tracking devices, that option was nixed when the company was shuttered. Your vital stats are represented in the form of a "wellness" butterfly, with each of the four wings representing an element of your body: weight, activity, sleep and heart rate. To continue that analogy, each section grows increasingly colorful as you collect more and more data. If you already own one of the company's scales, you'll find portions of this app are already chock-full of data. And if you have the flagship WS-50 scale in particular, the app will even tell you if you're breathing too much CO2 when you're asleep. The company also recommends that users check their heart rate twice a week, which you can schedule with a push alert, although they're far too easy to dismiss while on the go. Indeed, my own checks were a bit "feast or famine," meaning I tested my heart rate regularly when I remembered, and skipped it when I didn't. In order to pull the data from the Pulse to your smartphone, you need to activate the unit's Bluetooth module with a long-press of the button. Connect the device to your smartphone and you'll see a prompt for syncing your data and updating the device's firmware. During our time with the Pulse, we got an update that increased the amount of scrollable data from four days' worth to 10, and we're hopeful that further tweaks will grant us even more control. Once you've synced your data, a dialogue box offers a little commentary on your progress. For instance, after a sedentary week, I spent the weekend walking along the local coastline and racked up about 15 kilometers. When this data was uploaded to the app, however, it read, "We exercised 85 minutes these past seven days. Let's try and reach the recommended 150 minutes!" followed by a corresponding increase in that butterfly wing. It may have been egotistical of me, possibly even needy, but I was hoping for something better than that. The Pulse itself can detect when you're jogging and will continue to calculate a running period even when you stop. But when you upload that data to the app, the only way you can tell you've run is because the activity graph will be tinted orange instead of the usual blue. Perhaps it's because I'm a delicate flower who needs constant encouragement, but the Pulse's demanding-yet-indifferent approach to motivation didn't do it for me. 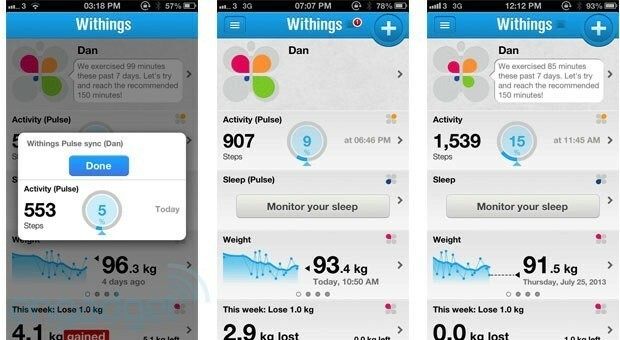 Withings' most direct competitor is -- surprise, surprise -- the Fitbit One pedometer / sleep tracker. The two are priced the same ($100) and do a similar thing in a similar form factor. Both attach to your body with a silicone clip and use a wristband to track your sleeping patterns. Where the pair differs, however, is that the One offers an always-on Bluetooth 4.0 dongle to connect to your PC. The company also sells the Fitbit Flex, which is priced the same as the One, but relies on a silicone wristband rather than a waistband clip, and ditches the OLED display in favor of LED indicator lights. Nike's FuelBand is a $149 wristband that's more focused on your physical activity and step count (it doesn't track sleep). Those stats are then converted into a "Fuel" figure against which you can set goals. Finally, now that Jawbone has fixed the various issues that plagued the original Up, the $130 wristband offers a vibrating alarm clock and app-based food tracking, in addition to the sorts of features offered on the Pulse. As you may have gathered, we generally like the Pulse, but it has some problems that could ultimately hamper its success. First, unless you're deeply worried or you're under medical guidance, it's probably not healthy to constantly monitor your heart rate on a moment-to-moment basis. And at the risk of banging on about the same issue, we're also concerned about how passive the Pulse is. 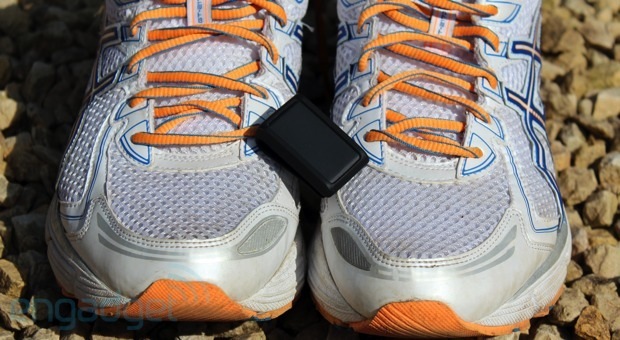 If you want a fitness tracker just to monitor your activity, this is great. But if you need motivation to stay active, forget it. While beautifully designed, the companion app is austere and indifferent to your needs. Do well in a week, and it'll report your step count the same as ever. Do badly, and it's more of the same. We'd love it if, during a sedentary week, the app raised hue and cry in order to motivate us into stepping away from our desks. We don't think that's asking too much, and we're sure that some kind-hearted soul could add that to the Health Mate app without too much fuss... couldn't they?